﻿ It’s easy to look at a band with the stylings of Night Riots and pass them off as typical ‘power-pop’, designed to be played loud on the radio and not much else – maybe a synchronisation to some new video game trailer if they’re lucky. This injudicious thinking is forgivable especially when Imagine Dragons have made their career using the exact same formula, but Night Riots are so much more than that. In fact Love Gloom is their direct challenge to anyone who sees them as another passable, flavourless act devoid from art or expression. They’ve pitched their tent somewhere in the grey area between pop, punk and electronic-rock, snarling at anyone who demands they attach to a label. Spending his early life traveling Europe, Travis Hawley settled in Templeton – twenty-five miles east of California. It’s a town where not much happens, luckily boredom conditions a great musician. Recruiting school friends Rico Rodriguez, who grew up in nearby Fresno, and three of Hawley’s classmates; bassist Mikel Van Kranenburg, guitarists Nick Fotinakes and Matt DePauw, Night Riots were spawned with seemingly one clear purpose – push the edges of music as they know it. A band of talented lyricists means only a small number of listens to their anthemic Contagious is enough transport you to their origins. The track flashes the phrase “I am no one’s fault” and “flesh of the father” almost like a sign of pride – they’re telling us that they’re not ashamed of where they come from, and that they haven’t quite found their place in the universe yet, who has? It’s a powerful track, not just in lyrical content but in sound. There’s a sense that the artists are venting here, getting something off their chest and can no longer hold their breath – with surgical precision Hawley dissects his own feelings with massive pay off. Themes of religion, power, freewill and our lack of weave their way throughout the handcrafted Nothing Personal. A warm guitar gestures inward, before Night Riots set out their manifesto: “We’re the stars now, can’t you see?”. This is a track with much to say, making a point to tell us that while we have no true self-control it doesn’t matter in the end, we’re part of a wheel, or rather, “An endless cycle, flesh to bone”. Hawley continues, playing the character of a higher power controlling our actions – one who declares that our freewill is no longer ours: “I control you, far above you”. His masterfully written lyrics are tastefully paired with the bands synthetic rhythms, dipping and dodging their way between verse and chorus. This track is on another level, brilliantly blending the band’s focus on living between the line and defying critical expectations. An album which takes you by surprise, Night Riots have flexed their muscles with Love Gloom. They’ve shown us that labels are overrated with this album. For alternative music to evolve and grow again, bands must now see past genre and experiment– Love Gloom serves as an example of this. Fangs, Contagious and Nothing Personal stand out as this album’s best, and with plenty of room to grow, Night Riots are destined for greatness. 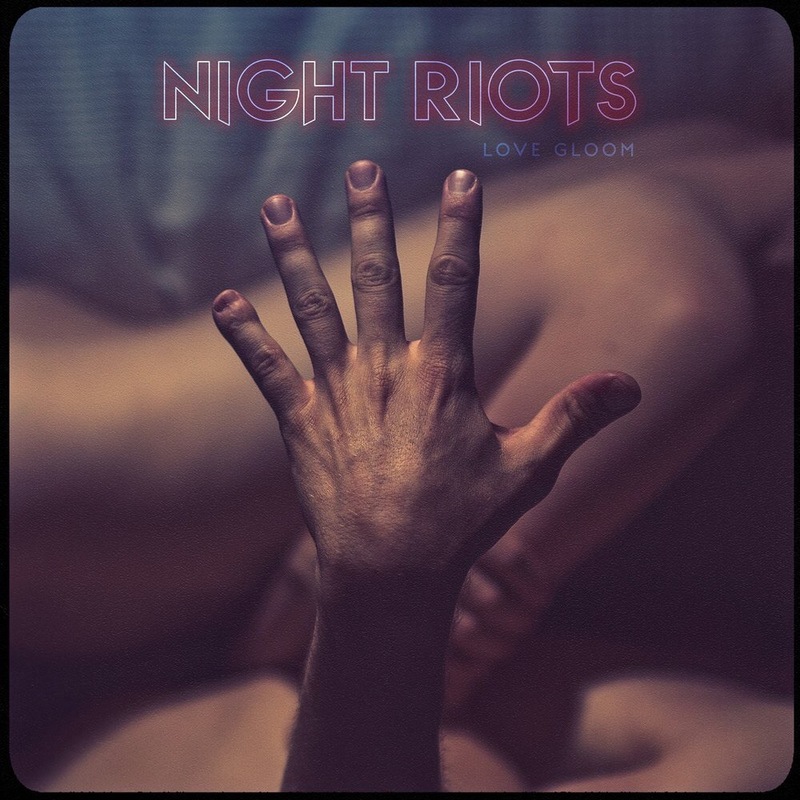 ‘Love Gloom’ by Night Riots is released on 22nd September on Sumerian Records.